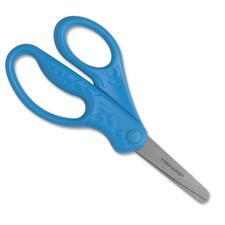 All-purpose 8" scissors with straight plastic handles are ideal for light everyday use in the home or office. Lightweight, durable, stainless steel blades are corrosion-resistant. Pointed scissors can be used by left-handed or right-handed cutters. Plastic ruler is durable and shatterproof. Both sides feature raised beveled edges. One side has Imperial measurements with 1/16" markings. Measurements on the other side are in millimeters. Slot and hole in the middle of the ruler allow storage in three-ring binders. 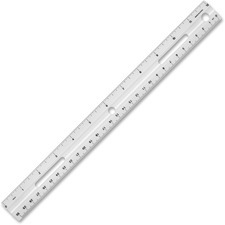 Opaque 12"/30cm ruler is three-hole punched for easy storage in binders. Imperial and metric markings are scaled in 1/16'' increments on one edge and millimeters on the other. Utility knife offers quick, easy blade change with no tools. Design includes an ergonomic handle with rubber grip and a self-retracting blade. 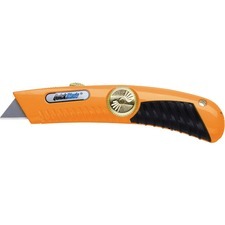 Utility knife includes one DuraTip safety blade and uses standard utility blades. Heavy-duty rotary trimmer handles large-size projects. Effortlessly trims from one sheet of tissue up to 30 sheets of 20 lb. bond paper. Also cuts laminated materials, cardstock, matboard and foam board. 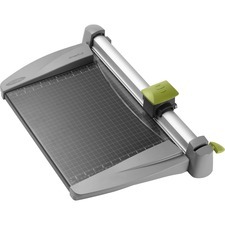 Paper clamp eliminates air that fans pages and holds paper firmly in place to ensure precise cuts. Ergonomically designed blade handle keeps fingers away from blade. Enclosed stainless steel rotary blade precision cuts in both directions. Adjustable paper guide, alignment grid and ruler with imperial metric measurements help position sheets. Offers a sturdy metal base. 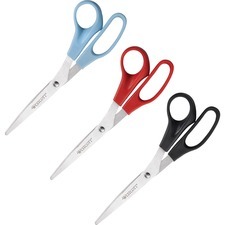 Designed for school-age children, scissors feature rust-resistant, stainless steel blades with special angle ground edges. Molded plastic handles are comfortable for little hands. Designed for left-handed or right-handed use. Blunt tip for added safety. For ages four and up. Blunt-tip scissors are optimized for comfort, control and accuracy to reduce fatigue by more than 40 percent. Spring-assist improves cutting efficiency for effortless handling. Ambidextrous design ensures comfortable use by both right-handed and left-handed users. Antimicrobial handle protection inhibits the growth of bacterial odors and helps prevent product deterioration. 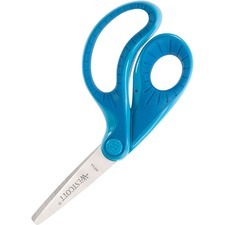 5" scissors are designed for use by children ages 4 to 6. 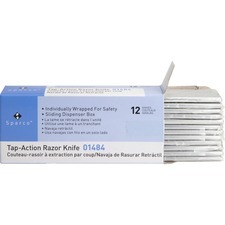 Tap Action Razor Knife uses retractable, reversible single-edge razor blades. Knife weighs 1 oz. Preset blade exposure prevents merchandise damage. Tap and blade appears. Tap again, and it disappears. 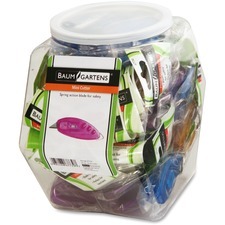 Convenient tub showcases Baumgartens Mini Cutters in assorted colors. The plastic tub includes a snap-on plastic lid for easy sealing. With a rounded point for safety concerns and a spring to retract the blade into the housing, this miniature knife makes for a perfect key chain addition or desk accessory. The blade is sharp so be careful. Mini cutters meet or exceed standard for RoHS compliance for lead, mercury, bromine, chrome and cadmium.